Welcome to the (second) biggest night of the pro wrestling year: SummerSlam! They're back in Brooklyn (Brooklyn), and yes, there are some black superstars on the card. Well, not R-Truth. Or Apollo Crews. Or Titus O'Neil (technically). But you know what? We've got some progress this year...right? 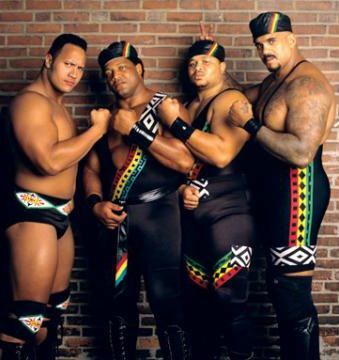 Here's a look at what black folk did tonight at SummerSlam. We can't have nice things. That match was pretty lit, though, as were their outfits. Looks like the dirtsheets were wrong about the WWE wanting to have Naomi hold the Women's Championship for a long time. Great match with Natalya, but she ended up tapping. At this point in the show, the WWE did black rasslers dirty at SummerSlam. Hell, even Tozawa lost the Cruiserweight title, meaning Titus Worldwide's big win was very short lived. Guess Naomi had to lose so Sasha could become a four-time Women's champion. Praise Black Jesus, especially because this win means Sasha broke her #BrooklynCurse. Is it bad to imagine that when Sasha says "I did it for us," she means for black people and NOT Bayley and her? Maybe there's some light at the end of the tunnel. We doubt it, though.